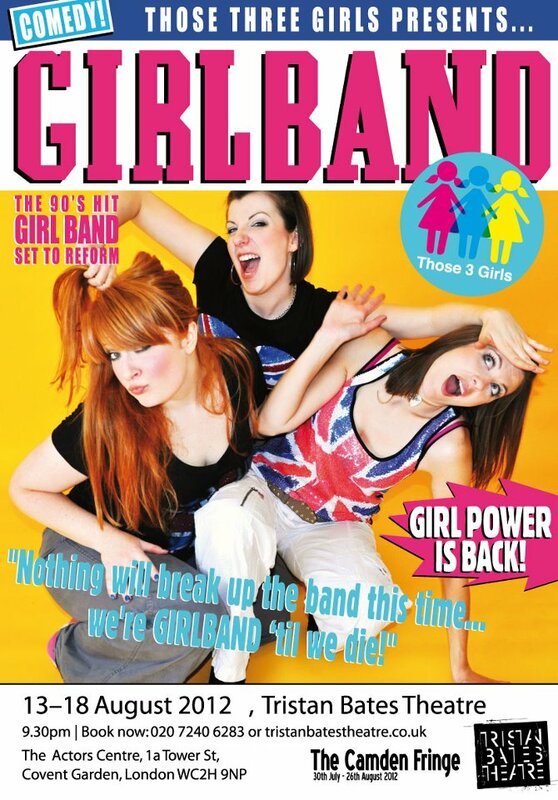 Fortuitous timing may have worked to GIRLBAND’s advantage but with my experiences of WAG: The Musical still painfully raw there was a certain trepidation about launching myself back into the world of spoof musical celebrity culture. However I need not have worried, Those Three Girls (Carly Sheppard, Lucy Barnett & Susie Peters) have produced a very enjoyable concept that actually relies less on the traditional cliches associated with manufactured pop-bands and more on the wider-impact that fandom has on those that support them. Whilst not avoiding easy laughs (it is a comedy after all), the production retains poignancy as the central action is focussed on the Fans rather than the Band and the audience is invited to both laugh and feel sympathy for these characters. This is reflected in the script which at times owes a debt to Alan Bennett’s comic monologues, with a style that is primarily direct to-the-audience and containing a wry humour that is often laced with an underlying melancholy. The production rests on the cast and one of their strengths is that they all bring something different to the table. Lucy Barnett’s Ceri, living a deluded life of celebrity in the Mumbles, is a wonderful creation and most in spirit to Bennett’s famous Talking Heads monologues, whilst Carly Sheppard’s Kelly and Jenny wouldn’t seem out of place on a sketch show. However for sheer versatility, Susannah Adele’s Debra, Saskia and Roz take some beating – each character is given a very clear identity and they are played with a whole-hearted conviction that allows to Adele to draw laughs from potentially well-worn comic tropes (the posh PR manager Saskia is the closest the production gets to a stock character). GIRLBAND is not the finished article and it will be interesting to see how it develops. Some of the staging needs to be rethought, as it is a difficult feat to sustain coherence during multiple character changes in a small cast, and perhaps more use could have been made of the video projections to provide variation but these are small quibbles against the more important fact that GIRLBAND is funny, and consistently funny, and it is done so through the old staples of comedy – well-crafted one liners, character acting and recurring punchlines – which makes it easy to forgive any of the rougher edges. Overall it makes for an enjoyable evening and a worthy contribution to the ongoing Camden Fringe.